First child born to Anglo-American overland emigrants in Santa Clara County. Erected 1976 by E Clampus Vitus, Mountain Charlie Chapter No. 1850. Location. 37° 18.028′ N, 121° 51.521′ W. Marker is in San Jose, California, in Santa Clara County. Marker can be reached from Curtner Avenue, on the right when traveling east. Touch for map. 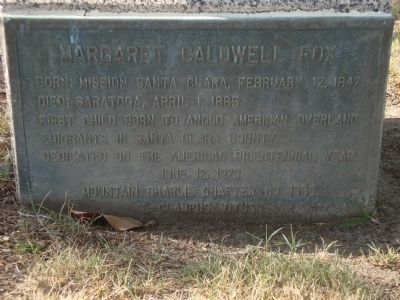 This marker is attached to the Fox tombstone which is located in the northeast part (there are four) of Section I in Oak Hill Cemetery. 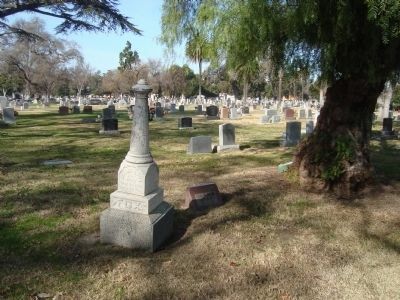 The cemetery is located at the intersection of Curtner Avenue and Monterey Highway (State Route 82). Marker is at or near this postal address: 300 Curtner Avenue, San Jose CA 95125, United States of America. Touch for directions. (about 800 feet away); Jean Jacques Vioget (approx. 0.2 miles away); Dr. John Towsend (approx. 0.2 miles away); George Donner, Jr. (approx. ¼ mile away); Charles Henry McKiernan (approx. ¼ mile away); Dashaway Stables (approx. 1.3 miles away). Touch for a list and map of all markers in San Jose. More. Search the internet for Margaret Caldwell Fox. Credits. This page was last revised on June 16, 2016. This page originally submitted on February 4, 2012, by Barry Swackhamer of San Jose, California. This page has been viewed 586 times since then and 7 times this year. Photos: 1, 2. submitted on February 4, 2012, by Barry Swackhamer of San Jose, California. • Syd Whittle was the editor who published this page.